Your weapons will get dirty as you play through Metro Exodus, and if you want to clean them, you’ll have to find a workbench. In an interview, the game’s executive producer, John Bloch, told PCGN that while there are some things you can do in the heat of battle with your backpack, other features will require you to find a workbench. You’ve seen the Aurora, now check out our list of free Steam trains. Oh wait, sorry, that’s free Steam games. That means that “if you go into a dirty area, if you get into water, if there’s a storm or something like that […] over time, the weapons will develop dirt and grime on them.” In turn, that means that “you’re going to have to clean and maintain them,” something you can only do at a work bench. While you can craft simple things like crossbow bolts from the backpack, Bloch says that “there are limited things you can do with it […] that are critical to gameplay in the moment.” More important things, however, like crafting armour, or ammunition for your main weapons – and cleaning your weapon, as it happens – will require you to find a workbench, or risk your weapons jamming up. 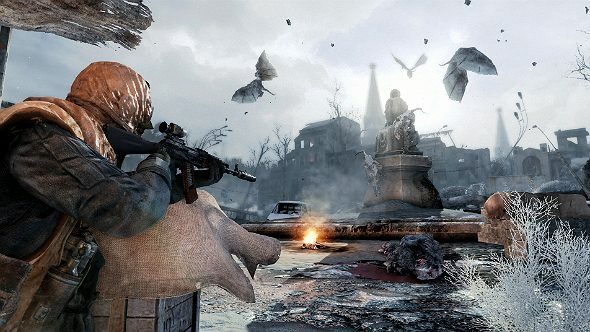 The Metro Exodus release date is later this summer, so you don’t have to wait too long until you can head out on the Aurora. Personally, you can keep your open levels – I’m just here for the excellent steam train.